The figure is an example showing the type A unit. To adjust the volume, turn the power/ volume dial. Turn the power/volume dial clockwise to increase volume, anticlockwise to decrease it. to select the function. The selected function will be indicated. *2 Depending on the model, this function may not be available. If not operated for several seconds, the display returns to the previous display. seconds. The unit will beep and “ CLEAR ” will be displayed. The AF function of the Radio Data System (RDS) can be set on or off. 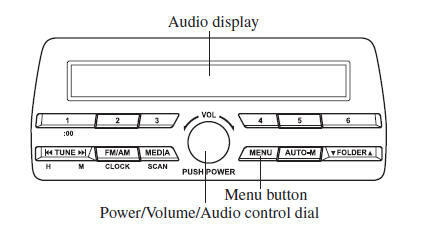 Refer to Operating the Radio (Type B) on page 5-36 . The REG function of the Radio Data System (RDS) can be set on or off. The setting for the operation sound when pressing and holding a button can be changed. The initial setting is ON. Set to OFF to mute the operation sound. Music and other audio such as voice data recorded on portable audio devices and mobile phones available on the market which are equipped with the Bluetooth ® transmission function can be listened to via wireless transmission over the vehicle's speakers. Using the BT SETUP mode, these devices can be programmed to the Bluetooth® unit or changed (page 5-94 ). Rotating the audio control dial switches the display between 12 and 24-hour clock time (page 5-32 ). The clock can be set at any time when the ignition is switched to ACC or ON. until a beep is heard. The clock's current time will fl ash. clock's current time is fl ashing. minutes advance while the minute set button ( ) is pressed. again to start the clock. for about 2 seconds until a beep is heard. Press the :00 button ( 1 ). When the :00 button ( 1 ) is pressed, the seconds will start at “ 00 ”. several times until 12 and 24-hour clock time are displayed. Turn the audio control dial in either direction, select the desired clock setting while the preferred clock time is fl ashing. to turn the radio on. The selected mode will be indicated. If the FM broadcast signal becomes weak, reception automatically changes from STEREO to MONO for reduced noise. 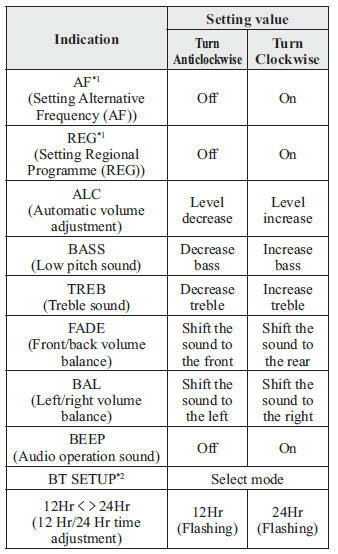 The radio has the following tuning methods: Manual, Seek, Scan, Preset channel, and Auto memory tuning. The easiest way to tune stations is to set them on preset channels. Select the station by pressing the tuning button ( ) lightly. pressed until a beep sound is heard. The search stops when a station is found. If you continue to press and hold the button, the frequency will continue changing without stopping.
) to automatically sample strong stations. To set a channel fi rst select AM, FM1, or FM2. Tune to the desired station. Press a channel preset button for about 2 seconds until a beep is heard. Repeat this operation for the other stations and bands you want to store. beep is heard; the system will automatically scan and temporarily store up to 6 stations with the strongest frequencies in each selected band in that area. to recall stations from the auto-stored stations. One stored station will be selected each time and its frequency and channel number will be displayed. If no stations can be tuned after scanning operations, “ A ” will be displayed. to automatically sample strong stations. The 6 preset channels can be used to store 6 MW/LW and 12 FM stations. To set a channel fi rst select MW/LW, FM1, or FM2. Tune to the desired station. To tune one in the memory, select MW/LW, FM1, or FM2 and then press its channel preset button. The station frequency or the channel number will be displayed. The radio data system (RDS) does not function if it is out of the system's service coverage area. mode to turn it on and “ AF ” will be displayed. If the radio reception of the current station weakens, the system switches to an alternative station automatically. turn it on. “ REG ON ” is displayed. To cancel it, press the audio control dial and select the REG mode to turn it off. “ REG OFF ” is displayed.
) is pressed, the unit switches to TA mode and “ TA ” is displayed. If a TA broadcast is received while in the TA mode, the TA broadcast intercedes even while using other functions (FM, CD, USB, iPod, AUX, or BT audio), and “ Traffi c Info ” is displayed. broadcast and return to the previous mode. Some FM stations transmit programmetype codes. This code enables alternative stations transmitting the same programmetype code to be found quickly. programme-type code and “ PTY ” will be displayed during reception. If there is no programme-type code, “ None ” will be displayed. Press the pre-programmed channel preset button ( 1 to 6 ). Press the Programme-type information button ( ). The unit will scan for broadcasts, if none are found, “ Nothing ” will be displayed and the unit will return to the previously tuned band. While the programme type is displayed, press a channel preset button for about 2 seconds. If an emergency broadcast is received, the emergency broadcast intercedes even while using other functions (FM, CD, USB, iPod, AUX, or BT audio), and “ Alarm! ” is displayed. When the emergency broadcast ends, the system will return to the previous mode. 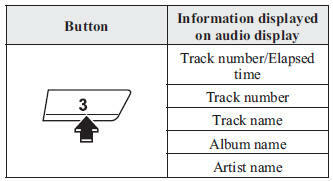 If a disc has both music data (CDDA) and MP3/WMA/AAC fi les, playback of the two or three fi le types differs depending on how the disc was recorded. to switch to CD mode and start playback. The CD mode cannot be selected if a CD has not been inserted. To stop playback, press the Play/Pause button ( 4 ). Press the button again to resume playback. to advance through a track at high speed. once to skip forward to the beginning of the next track. after a few seconds have elapsed to start playback from the beginning of the current track. This function scans the titles on a CD and plays 10 seconds of each song to aid you in fi nding a song you want to listen to. during playback to start the scan play operation (the track number will fl ash). again to cancel scan playback. playback to start the scan play operation (the track number will fl ash). the bottom of the display area). Press the button again to cancel the repeat playback. To cancel the repeat playback, press the button again after 3 seconds. Press the repeat button ( 1 ) during playback, and then press the button again within 3 seconds to play the tracks in the current folder repeatedly. is displayed next to RPT at the bottom of the display area). Tracks are randomly selected and played. RDM at the bottom of the display area). Press the button again to cancel the random playback. to RDM at the bottom of the display area). To cancel the random playback, press the button again after 3 seconds. displayed next to RDM at the bottom of the display area). The information displayed on the audio display changes as follows each time the text button ( 3 ) is pressed during playback. 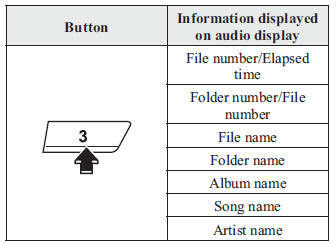 The information viewable in the display is only CD information (such as artist name, song title) which has been recorded to the CD. This unit cannot display some characters. Characters which cannot be displayed are indicated by an asterisk ( ). Only 13 characters can be displayed at one time. To display the rest of the characters of a long title, press and hold the text button ( 3 ). The display scrolls the next 13 characters. Press and hold the text button ( 3 ) again after the last 13 characters have been displayed to return to the beginning of the title. If “ CHECK CD ” is displayed, it means that there is some CD malfunction. Check the CD for damage, dirt, or smudges, and then properly reinsert it. If the message appears again, insert another known good CD. If the message continues to appear, take the unit to an expert repairer, we recommend an Authorised Mazda Repairer for service. Use a commercially-available, nonimpedance (3.5 ) stereo mini plug lead. Contact an expert repairer, we recommend an Authorised Mazda Repairer for details. In addition, audio can be played from the vehicle audio device by connecting a USB device or an iPod to the USB port. 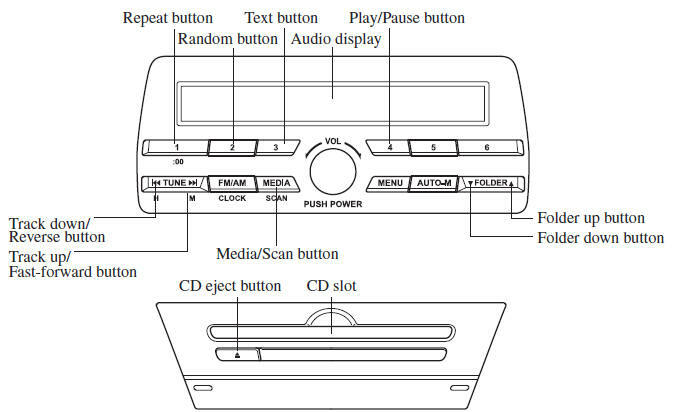 Refer to AUX/USB/iPod mode on page 5-71 . If you see an error indication on the audio display, fi nd the cause in the chart. If you cannot clear the error indication, take the vehicle to an expert repairer, we recommend an Authorised Mazda Repairer. CHECK CD CD is inserted upside down Insert the CD properly. If the error indication continues to display, consult an expert repairer, we recommend an Authorised Mazda Repairer. CD is defective Insert another CD properly. If the error indication continues to display, consult an expert repairer, we recommend an Authorised Mazda Repairer.